← Guest Blog: All geared up for patient transport! 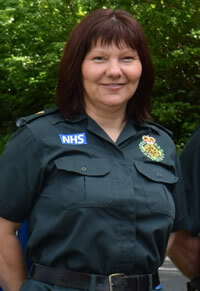 Diane Chan, a Senior Locality Manager for the East of England Ambulance Service NHS Trust (EEAST), shares her memories of the beginnings of the cycle response unit in Norwich. “I was very proud to become the first female cycle responder in England. Ian Colquhoun, who was a well-known figure in Norwich and was a paramedic at Bracondale, was very keen to pilot a motorbike in Norwich. However, that did not get approval so he went for the second best thing which was a pushbike. Ian, myself, and Marcus Bailey, who is now the Trust’s Consultant Paramedic, became the first cycle responders and the pilot was very successful. We used to do about six jobs a day and because the majority of jobs were fits, falls or faints, we could treat on scene and prevented an ambulance from being called, which improved performance locally. Shop keepers felt reassured and it was reassuring for the public that we were there and we used to get people coming up to us with medication review questions and asking for advice. Cycling around was quite difficult and on a Saturday when it was quite busy, it was quite precarious to get around and because it was the first CRU bicycle, it was very heavy. I was on the Norwich CRU for four years and one of the most memorable days was attending two births in one day, which is incredibly rare. I attended a job at Iceland where a baby was born just before I arrived and I delivered another baby in Debenhams. Thankfully, I had two maternity packs on me that day! I was proud to be an advocate for the service and my actions were always being watched on CCTV. I used to push the bike around virtually all day and talk to people and the distances between jobs were fairly short and our response times were usually very quick. This entry was posted in #CRUtakeover, Ambulance Service, CRU, Cycle Response Unit and tagged #CRUtakeover, 999, ambulance service, CRU, Cycle Response Unit, EEAST, Emergency Services. Bookmark the permalink.